NOWFE :: The Ultimate Taste Experience! 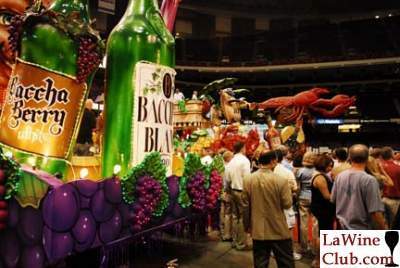 After a quiet night at the Hotel Monteleone we woke up the next morning a trifle hung-over from the Royal Street festivities, but after three cafe au laits (no beignets because we were heading for the MAIN EVENT) we were wired and ready to go. Comfy Shoes-Check! Tickets-Check! Elastic Waistbands-Check! We waited in the entrance line for the final countdown-the doors opened- and WOW! Even after all the food & wine events that I’ve attended over the years, I was still awe-struck by the plethora of the culinary delights. It was like entering the pearly “southern” gates of Food Heaven! For the next two days I nibbled, chowed down, imbibed, and simply pigged-out on restaurant offerings such as: 5Fifty’s Duck Sliders, Bourbon-Chili Glazed Shrimp, The Ritz Carlton’s Melange “Trio of Foie Gras”, Wasabi Crusted Tuna, Crawfish/Corn/Avocado Salad, Bacco’s Lobster Raviolis, Muriel’s Crawfish and Goat Cheese Crepes, Blackened Crawfish Risotto, Dakota’s incredibly rich Crabmeat & Brie Soup, Rootbeer Pound Cake, Whiskey Bread Pudding, Bananas Foster and Strawberry Creme Brulee. I couldn’t begin to recap all the incredible wines (over 3500 corks were popped for this event,)but I began with Veuve Clicquot and ended with a succulent dessert wine from Oregon’s Elk Cove, with many fine new and old-world wines in between. Wait…hot off the press-I just found out that the dates have been set for next year, so don’t say I’m not giving you plenty of warning to Save May 18-22, 2009 for the next NOWFE! Would love to attend this show. hic.